Otranto, is a gem of the Salento region. It is situated in the easternmost point of Italy and represents the perfect combination of natural beauty, history, art and architecture. The town, situated in the province of Lecce, offers many attractions of historical and artistic interest, with amazing glimpses of rare beauty. 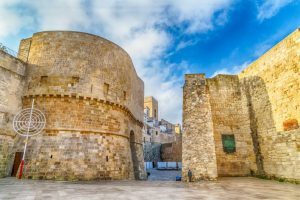 A visitor to Otranto can admire its traces of the past, from the Norman period to the Turkish invasion; Otranto was indeed at the crossroads of several conflicts that left indelible marks on the territory and on the architecture of the town. Besides the beauty of the old town and its winding lanes, a visitor to Otranto can admire the ancient Castle, built by the Aragonese of Naples between 1485 and 1498. In the old town there is also the wonderful San Pietro’s Church, a fine example of the Byzantine religious tradition in Apulia. At the highest point of Otranto there is the Annunziata’s Cathedral which was built from the remains of a Roman domus and a paleochristian temple; inside the church there is the fascinating mosaic on the floor which has pictures referring to the Tree of Life, revisiting the human stages of life from original sin to salvation. Other than its monuments and its historical-cultural places of rare beauty, Otranto boasts some of the best beaches in Salento. These wonderful white beaches serve as framework for the clear and cristalline sea, creating beautiful inlets surrounded by lovely green pinewoods. 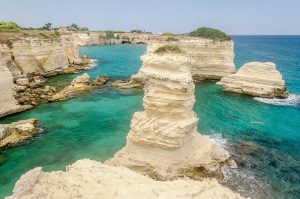 Not far from Otranto, a few kilomotres to the North, you find Torre dell’Orso, part of the Municipality of Melendugno, one of the most popular seaside locations in the area. Visitors taking holidays in Torre dell’Orso should not miss the chance to admire the “Due sorelle (Two Sisters)”: two big stacks rising from the sea not far from the beach. Torre dell’Orso is not only a wonderful seaside location but alsoa place with an active night life. At night you can go for a walk in the center where you can find some stalls selling local products: from the local handicraft to the typical food and wine. Moreover, you can have fun nights by attending a beach party dancing in time to the music. Last but not least you can enjoy the extraordinary and typical cultural and gastronomic reality of Salento. Salento is this and more. Natural landscape, good food, relaxation, fun and wonderful people: A region which will leave an indelible mark in your heart.